Subaru's Forester offered car buyers a cross0ver choice before the motor industry had even come up with the name for the segment. Based largely on the Impreza saloon's mechanicals, the Forester rides on higher suspension and has a taller, estate-style body to create a SUV-type machine with excellent utility and still impressive car-like driving dynamics. Subaru has always been a niche car maker, with certain quirks including a predominantly four-wheel drive model range and 'boxer' rather than conventional in-line engines. Those boxer engines mean a low centre of gravity, which helps deliver one of Subaru's other hallmarks - driver appeal. That's true here even with the higher-riding Forester, which, despite its SUV-like stance and ability, delivers driving dynamics that are more car-like than any of its rivals. Given it's based on the excellent Impreza then it really is enjoyable. Like its Impreza relation the Forester is available in everything from an ordinary, mild mannered mainstream model to a wild STI turbocharged machine that'll scare sports- and supercars. Those faster models are niche, imported machines though, the Forester only every readily available in its more sensible specifications here. You'll only find 2.0- and 2.5-litre models in the classifieds for the 2003-2008 car, as a turbodiesel offering didn't make it to Subaru showrooms until this version's replacement post-2008. The 2.0-litre makes up the majority of the available cars in Ireland, it delivering 158hp and offered with a choice of either manual or automatic gearboxes. That automatic will dent economy - something even the manual cars aren't noted for. All should include air conditioning, alloy wheels, an adjustable steering wheel and CD player as standard. 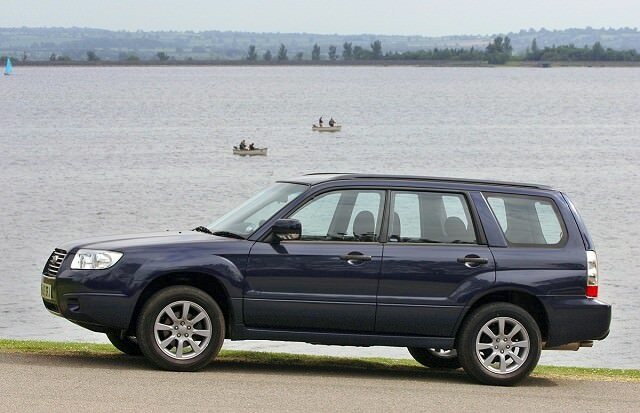 From 2006 the Forester gained a revised look, with a new face comprising new headlamps, grille and bumper and a re-profiled bonnet, while the rear lights and some interior trim were also changed. High-ish fuel consumption has always been an issue with the Forester, but reliability should be a given. So too is a hard, shiny plastic interior, which might lack tactile and visual joy, but makes up for that with certain longevity. A 2.0-litre X or XT manual is the most commonly available and there's good reason for that - it'll do everything you want it to do, comes decently equipped and offers decent utility with reasonable running costs. The Forester has always had a small and loyal following, and rightly so. Its car-like dynamics mean it's fun to drive, and while fuel consumption is high, reliability is assured. A useful all-rounder for those who need its utility.